"Israel is a cancerous tumor that must be removed and uprooted," Hamas's PM says in a conference on education. Hamas's de-facto Prime Minister in Gaza, Ismail Haniyeh, took advantage of an educational conference on Tuesday to attack Israel, Channel 10 News reported. "Israel is a cancerous tumor that must be removed and uprooted," Haniyeh was quoted as having said during an international conference on education. "The hand of the resistance and the jihad fighters has begun to uproot the tumor, and will work to end the occupation of Palestine as a whole. Allah willing, we will break the occupation," Haniyeh said in a speech which was heard by representatives from Egypt, Tunisia and Qatar. He called for Gazan teachers to "raise a generation that will fight and liberate the Palestinians from the occupation," according to Channel 10. Haniyeh added that his organization is working to rebuild the destruction caused by Israel during the various wars in Gaza. Recent Palestinian Authority polls have indicated that Hamas is gaining strength at the expense of PA Chairman Mahmoud Abbas. A new independent poll in the PA, released last week, found that Arabs in Judea, Samaria and Gaza are rejecting Abbas in favor of Haniyeh. The results of the survey by the Palestinian Center for Policy and Survey Research are a sharp reversal from three months ago, when respondents gave Abbas a 51-40 percent lead. Haniyeh now leads by three percentage points. A report in the London Sunday Times this week said that Hamas is preparing to duplicate its 2007 civil war in Gaza and has instructed terror cells in Judea and Samaria to get ready for a military coup to oust Abbas. 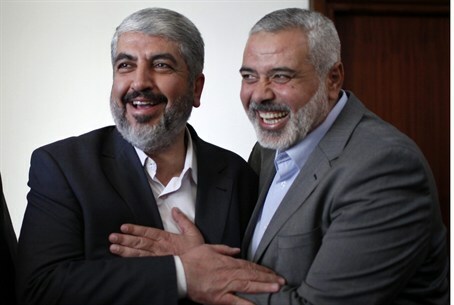 The orders reportedly came from Hamas’ supreme leader Khaled Mashaal, who recently visited Gaza to celebrate what the terrorist organization claimed was a victory over Israel in last month’s missile war. Hamas denied the reports, saying they were nothing more than “Israeli incitement” aimed at dividing PA factions.